Sound "A robust yet defined ability to portray the music"; "imbues the music with a sense of body and bloom, capturing the 'whole' of the instrument as opposed to the leading and trailing edges"; has "a knack for getting the most out of some smaller-scale music." are said to minimize the influence of RFI"; no remote control. Use Needs 50-100 hours of break-in; no power cord included, but David found that the Matisse Reference Type II power cord "transformed" the Fantasy Mk II. Value Lots of competition in the tubed arena, especially when the cost of a power cord is added, but "capable of some fine sonics" nonetheless. Roughly around the same time that the Henri Matisse exhibit arrived at Torontos Art Gallery of Ontario for a three-month exhibition from the Baltimore Museum of Art, another piece bearing the name of this celebrated artist arrived in Toronto: the Matisse Fantasy Mk II preamplifier. Assuming the name of an impressionistic artist for an audio company could be considered a bit of a loaded proposition: fine audio gear is primarily designed to pass the music along with little or no added artifice of its own, letting the music itself create its own impression. Of course, that would assume a perfect world, right? 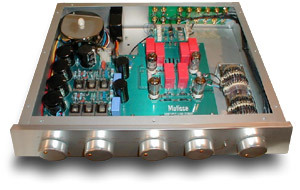 The Fantasy Mk II preamp is a single-box, line-stage-only affair. Unlike other makers that choose to house the power supply in an external box connected via an umbilical, Matisse has chosen to pay particular attention to isolate the power supply as much as possible within the single chassis. Thus the transformer is completely isolated inside a mu-metal protective shell in the far-left corner. The circuit design is fairly simple, comprising of two 12AT7s and two 12AX7s, which, as Matisse points out, breaks no new ground in terms of design innovation. The big improvements come in the choice of component parts and PCB material, circuit layout, and power-supply considerations, all of which are said to minimize the influence of RFI. Matisse has also chosen to use cadmium solder, which is unusually hard to work with in that it produces toxic fumes while molten -- definitely not something for DIY mod types here! The outward physical qualities of the Fantasy Mk II are that of simple elegance. A curious friend commented on its "clean and simple appearance." The review sample was finished in a fine-grain, brushed aluminum. Five nicely weighted control knobs across the front panel -- controlling source, balance, power, record selector, and volume level -- exuded a luxurious touch and control. The volume control is a 26-position, stepped resistor, ladder type featuring "hard gold" contacts. Costly to implement, it has the stated goal of getting out of the way of the signal more so than traditional volume controls. The balance control and record-out selector can be switched out of the circuit via small front-panel switches. This essentially transforms the Fantasy Mk II into a volume control with gain. The back panel is fairly standard, with fine-quality RCA jacks used and the now-standard detachable IEC power connector occupying most of the real estate. The Fantasy Mk II is not shipped with a power cord. It is expected that a prospective purchaser would have the wisdom to pursue an after-market power cord to make the connection. In this regard, Matisse sent along one of their Reference Type II power cords with the unit. I primarily spent time listening to the Fantasy Mk II with a Mark Levinson No.31 CD transport (or Sonic Frontiers SFT-1), Levinson No.360 D/A converter (Transparent Digital Reference cable alternated with a GutWire Chime Digital cable, both AES/EBU format). The No.360 was connected to the Fantasy Mk II via either Transparent Ultra or GutWires Chime Interconnect. 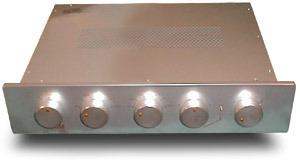 Power amp was the Krell KSA-200S, connected via Blue Circle BC95 interconnect run single-ended, as the Fantasy Mk II does not offer balanced operation. Speakers were the B&W Nautilus 804s. For comparison, I had on hand a Mark Levinson No.380 preamp. There is a rather unique operational quirk that I should make mention of. When powering the unit on, the first switch position powers the unit up, and keeps the unit in mute while things are stabilizing. This is indicated by a flashing red LED; when it goes solid red, you are ready to shift the switch to the on position. I would advise to wait at least another 30 seconds or so beyond the solid-red visual cue or you could be greeted with a large dose of tube-settling noise from your speakers -- hardly polite in an otherwise well-thought-out product. I mentioned the Matisse Reference Type II power cord, which costs $870. Although I dont usually choose to grade a product based on the performance of a power cord, in this case I have to make an exception. With a standard power cord, the Fantasy Mk II sounds pretty pedestrian. I suspect that if someone were auditioning this preamp in this configuration, it could easily be dismissed or passed over for something else. But the Reference Type II power cord transformed the Fantasy Mk II. The performance gained several notches in terms of focus and transparency, yielding a more solid bass foundation as well as a more lucid treble presentation. Thus, all evaluative listening was done with the Matisse Reference Type II power cord in place. During the break-in period, I was impressed by what the Fantasy Mk II was doing, but perhaps not more so than what I have heard from a number of other high-quality tube preamps that inhabit this range of the audio universe. In other words, I wasnt hearing something that would either make me stay up all night spinning discs or force me to yank out the checkbook. The well-written manual comments on giving the Fantasy Mk II a good 50 hours of play before doing any serious listening. If my experience with this preamp is any indicator, I think they need to up that figure to somewhere closer to 100 hours. Dont let anyone tell you that the break-in period is a myth. At least where this product was concerned, it resulted in a very tangible change. Beyond the break-in period, the sound became something completely different, displaying a robust yet defined ability to portray the music. There was a sense of solidity and confidence to what it was doing. Listening to Patricia Barbers "Inch Worm" from Café Blue [Blue Note/Premonition 7243 5 21810 2 5] yielded taught skin definition on the bongos, with the voice projecting forward and suspended in a fine acoustic. The bass realm was really complete, with lots of definition and weight present throughout this fine recording. Throughout the midrange, I found that the Fantasy Mk II definitely has what Sam Tellig has referred to many times as "palpable presence," or perhaps more accurately "tube magic." The Fantasy Mk II imbues the music with a sense of body and bloom, capturing the "whole" of the instrument as opposed to the leading and trailing edges. A selection from Griegs Peer Gynt, "Aases Death" [EMI Classics RCZ 7243 5 68392 2 9] let the strings soar through without aggression. All the emotion and feeling were portrayed quite wonderfully. It was in this realm that the Fantasy Mk II displayed its finest qualities: each instrument within a string ensemble became a distinct voice, yet was still part of the whole. And as I listened to more and more music with the Matisse preamp, I came to discover that it had a knack for getting the most out of some smaller-scale music -- jazz quartets, chamber music and the like. The fabulous Live Recordings at Red Rose Music SACD/CD sampler [Red Rose Music RRM 01] was a prime example of this, voices in particular sounding almost spooky-real. Most would argue that comparing the tubed Fantasy Mk II to the solid-state Mark Levinson No.380 would be the equivalent of comparing sugar to vinegar. Well, since the Levinson was the other heavy hitter in the house at the time, it seemed only logical to put the two side by side and see what might happen. Physically as well as sonically, I couldnt ask for two more different products. Each has its share of strengths and weaknesses, some of which could be ameliorated by careful system matching. The Levinson No.380 excels at control, both from a sonic perspective and a functionality level. It has what I consider to be the finest volume-level control of its type. The ability to find just the right volume setting for a given recording is something that, once you have lived with it, can be rather addictive. This plus the remote-control functionality, balanced inputs and outputs, and home-theater bypass make the No.380 a functional tour-de-force. Sonically the No.380s virtues are control and an even temperament. It has a borderline laid-back character that makes long-term listening sessions a total joy. The Fantasy Mk II, on the other hand, presents the music with a sense of grandeur, taking bigger strokes at the canvas yet still managing to reveal an astonishing amount of fine detail from within. The Fantasy Mk II also seems to convey more sense of body and slam to the music, the No.380 sounding just a bit hemmed in on the bottom, yet still mighty agile and focused. Dynamically, the Fantasy Mk II easily bettered the Levinson, as it was seemingly capable of near explosion when the music demanded it. However, on occasion I did find the Matisse preamp could be a bit relentless in this respect, not letting things happen in their own manner, but rather forcing the issue. Listening to the soundtrack from Titanic [Sony 63213] bore this out. With the Matisse preamp in the system, I got the feeling that the preamp was having more trouble keeping things organized, somehow losing the timing of some of the major percussive moments. Both preamps have fine treble, although the Matisse seemed more open up top, more effervescent, while the Levinson -- again -- exercised control and refinement, perhaps ultimately sounding a touch dark by comparison. In terms of perspective, the Fantasy Mk II presents images to the front of the speakers, but with good depth too. The Levinson, on the other hand, presented itself in a less up-front manner, serving the music from a more mid-hall perspective. I recommend auditioning the Matisse Fantasy Mk II line-stage preamp in the company of the Reference Type II power cord, albeit at the higher price it places on admission. Considered as a pair, the Fantasy Mk II and Reference Type II face some heavy competition from some pretty big names -- BAT, Lamm, Audio Research, and Conrad-Johnson all readily come to mind. That said, taken on its own and with some careful matching of ancillary equipment, the Fantasy Mk II is capable of some fine sonics indeed, and for some listeners it will be a very worthy venture. Price: $4750 USD; Reference Type II power cord, $870.